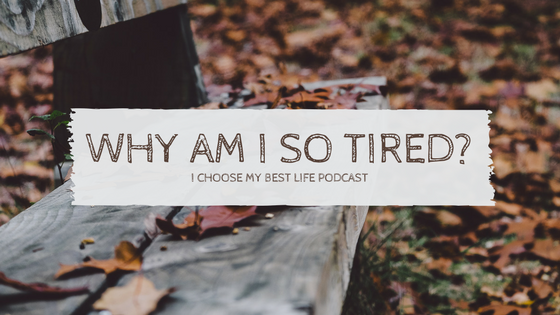 You are here: Home / Podcast / Why Am I Tired All The Time? One of the most common complaints I hear from people is that they feel tired all the time. They are drained, fatigued, exhausted, and some even admit they just feel burned out. We are all constantly busy and all our busyness keeps us pulled away from the things we really want to do, away from the things that make us feel happy, energized, and truly alive.We exchange our desire to get more done with our need to enjoy what we are doing. In the process, we often fail to realize that aborting rest empties of us everything holy. It strips away joy, peace, contentment, and happiness. It depletes us and leaves us feeling empty and drained. Have you ever tried to fix your chronically tired self by purposely sleeping a few extra hours on the weekend, only to wake up feeling like you’ve never rested at all? Here is where we miss it. SLEEP IS NOT REST. Sleep and rest work together to make sure every part of you has a way of being restored, but they are NOT the same thing. For most of us who feel tired all the time, the problem isn’t the need for simply more sleep the problem is a need for high-quality sleep. There are 3 phases of Non-REM sleep and 1 phase of REM sleep. Each night you cycle in and out of these 4 stages. In Stage 2: Your heart rate slows and your body temperature drops and you drift off into light sleep. You can awake but with some effort. In Stages 3-4: These are the stages many of us struggle to enter into and the ones needed for high-quality sleep. During stage 3-4 you are in deep sleep and it would be hard to wake you up and if awoken you would feel disoriented for a few minutes. During stages 3-4 of non- REM sleep is when you get restored. This is when the body is able to repair and your mind is able to reset itself. The fifth stage is REM sleep. You enter REM about 90 minutes after falling into deep sleep. REM is an active form of sleep and it’s where you dream and process information. REM stands for Rapid Eye Movement. It’s like watching a movie in your head and your body can respond as if you were actually there. Your eyes will dart around and your breathing speeds up. REM only accounts for 20% of your sleeping hours. The majority of your sleeping hours must be in the deeper sleep stages if you want to feel refreshed when you awake in the morning. High-quality good sleep causes your brain to cease actively processing, like in stage 3 non-REM. You lose your conscious awareness about your surroundings causing your brain and body to enter a quiet state. Bad sleep is restless and you stay on high alert. The mind may wonder sporadically over the events of the day, and you may find your legs continually moving in response to the pent-up tension in your muscles. There has to be a bridge between good and bad sleep, and that bridge is rest. Sleep is purely a physical activity. Rest, however, penetrates into the spiritual. Rest is what makes sleep sweet. So how can you do today to help you get higher quality sleep? Here’s one little mental and physical tactic I recommend and I call it untangling. Spend few minutes before going to bed each night untangling yourself from anything that has your feeling confined, tense, or bound. Untangle your mind by agreeing to let go of whatever emotion or thoughts that have consumed your day. Turn it over in prayer or by cleansing a negative thought with a scriptural truth. Untangle your body by identifying muscle groups that feel tight and do a little self-massage or some stretches. Do this with each area until you begin to feel the initial stages of peace, then allow that peace to lead you into sleep. I too get tired these days. May be I don’t get enough rest. It must be connected to my sleeping. These tips have solved my doubts about getting a quality sleep. Glad to hear you found them helpful Stephanie. Blessings to you.